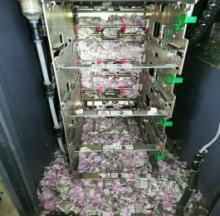 Rats with expensive tastes invaded an ATM machine in northeastern India and chewed up over $17,000 worth of rupee banknotes. This photo is reputed to be real photographic evidence of the size that the grasshoppers reached in the Midwest during the Great Depression. Try to get over the picture-perfect Lab in the photo and focus on his collar! Turns out an abandoned kitten rescued from a busy parking lot by a good samaritan wasn't actually a kitten – it's a wild bobcat kit. Garfield, the most famous cartoon cat, is now 40 years old (280 in cat years!). Here are some cute Garfield cat toys to help celebrate! Jurassic Park is a whole lot of fun -- a bloody lot of fun. Show your love for the dinosaur movie franchise with this awesome Jurassic Park Dinosaur T-Shirt. A tiny female seahorse named 'Frito' will once again ride the waves after rescuers removed fishing line from her neck and relocated the rehabbed fish back to her marine stomping grounds.